Condition: Now functions as a hotel. 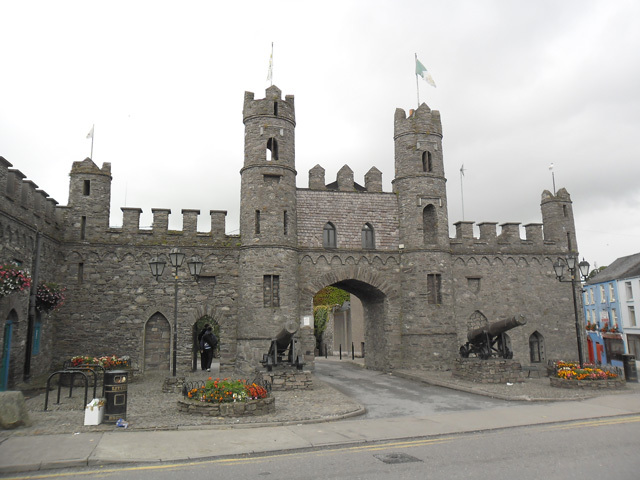 Notes: Macroom Castle stands in the town of Macroom, County Cork, Ireland, roughly half way between Cork and Killarney, guarding the historic ford across the River Sullane. It now functions as an hotel. The main building, based on the original keep, is a three story 6 bay by 3 bay block, which is now covered in ivy. The only other remaining building is the gatehouse and attached walls. The castle was probably erected in the 12th century by the O'Flynn family, as its Irish name of Caislean-i-Fhlionn suggests. The O'Flynns owned land in this part of what was then the Kingdom of Muskerry, but were overcome by the McCarthys, who were to occupy the Castle until the middle of the 17th century. Tiege MacCarty, father of Lord Muskerry, restored and enlarged the castle and died there in 1565. In 1602 the then owner, Cormac McDermot Carthy, Lord Muskerry was arrested and the castle subjected to siege, during which it caught fire. During the rebellion of 1641, Donough MacCarty, 2nd Viscount Muskerry was visited at the castle by the Papal Nuncio, who stayed for four days. In 1650 Boetius MacEgan, Bishop of Ross, assembled a Confederation army at the castle, but when the Cromwellian troops of Lord Broghill arrived, the castle garrison again set fire to the building before joining the rebel army in the castle park. During the ensuing battle the Bishop and the High Sheriff of Kerry were taken prisoners, the Sheriff shot and the bishop offered his freedom if he could persuade the garrison of Carrigadrohid Castle to surrender. However, on arrival at Carrigadrohid he chose instead to exhort the garrison to hold on and was hanged from a nearby tree. Later in the war Macroom Castle was said to have been burned yet again by General Ireton. During the Commonwealth era possession of the castle was given to Admiral Sir William Penn, the father of the founder of Pennsylvania. At the restoration of the Monarchy it was restored to the McCarthys, who further enlarged and renovated it. In 1691 the castle estate was confiscated from Donough MacCarty, 4th Earl of Clancarty for his allegiance to King James II and the castle sold by auction in 1703. It was acquired by the Hollow Sword Blade Co., who resold it to Judge Bernard. It then passed to the Hedges Eyre family and afterwards to Lord Ardilaun. The castle was burned for the last time in 1922, following the evacuation of British Auxiliaries from the town, by anti-treaty forces led by Erskine Childers and Frank O'Connor. Lady Olivia Ardilaun, a descendant of the McCarthy chiefs, and the widow of Lord Ardilaun, sold the castle demesne in 1924 to a group of local businessmen, to be held in trust for the people of the town.